Mind Bytes from My world !!! : Weekend with Bacardi and Coke !!! This weekend ( Fri nite , Sat day /nite , Sun day /nite) went as a mixed bag !! Mixed bad...why ?? Hmmm....I think I could have made more use of my time which I wasted lazing around and could have caught up with some pending personal work and stuff .I guess just didnt feel like it. There are some 20 + items on my personal to do list , which I havent even started on ...Lazy me !!! 30th Oct ( Sat Day ) : One of the big problems with sleeping in the mornings and waking up entire night is....there is NO DAY !!! I woke up at 4 in the afternoon ...literally cursing myself.However I work in my sleep...literally...Must have attended around a dozen phone calls on my mobile in my sleep and answered properly to them .Also must have replied to some 5 -6 sms messges while sleeping..Yeaahh...try it out ..its gr8!!! This is what I call TRUE MULTITASKING !! However I covered up a lot after I woke up and did my chores for the day in the evening !! 30th Oct ( Sat nite ) : Felt a little weird and undecided in the night. Didnt knew whether I wanted to go out to a club on Sat nite or not ??? Couldnt decide..till one of my freinds Nikhil forced me to come along ...We went to The Peppers at Bristol ( Gurgaon ) . Reached there around 11 and had a blast till 2 pm and came home at 3:30 am( very early from our standards !!) . 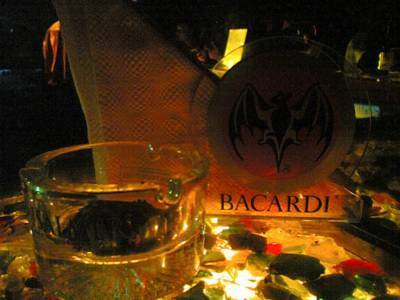 Not to forget after a loooong Navratras I had my fav drink ..BACARDI /w COKE ..pic on top !! .The crowd was good and awesome music by DJ Golzzzz ( Golzz in Hindi means someone who is fat , chubby and circular in shape. The resident DJ is called Golzz since he is chubby) .Watched TV for an hour or so and then came online and surfed around till 5 am . 31st Oct ( Sun day ) : Woke up at 2 in the afternoon .Read newspapers , watched some TV , lazed around and went for some shopping in evening !! 31st Oct ( nite ) : Made a schedule and task list for the coming week . Fixed my home pc and its weirdo drivers . ...and wot elzzzzz.........Bloggeeedddddddd !! !